Over 2000 herbs and plant based medicines are known to control blood glucose. However, not all herbal products are effective. Some are not safe. Others are toxic, even fatal. Many commercial “anti-diabetic” herb products are marketed as “safe, all-natural” alternatives. But many of these herb products lower blood glucose by inducing artificial indigestion, thereby preventing the digestion of food. These herbs are successful in lowering blood glucose levels, but at very high price. They are definitely not healthy. The effects should be proven scientifically. Testimonials alone are not enough to comprehensively prove the legitimacy of an herbal product. Anecdotal stories here and there from a friend of a friend are insufficient. You should look for reliable statistical studies that rule the possibility of the placebo effect by showing the results of a control group. There should be no negative side effects. If there are, then you might as well be taking the pharmaceutical drugs. Pharmaceutical drugs become useless over time dosages must be increased enough to maintain the same effectiveness. This happens with herbal products as well, so look for one that does not. The mode of action should be identified. This means that you should be able to find out how the herbal product works. This is especially important if you are planning to take the herbal product along with traditional pharmaceutical drugs. The treatment should be accessible. If the herbal product is so rare that you cannot even purchase it on a regular basis as needed, or it is so outrageously expensive – then what’s the point? It may work, but it won’t work for you because you cant get your hands on it! Use these guidelines to avoid the widespread myth that all herbal treatments are safe. In fact, many herbs are fatal. It is also incorrect to believe that herbal treatments are ineffective. Natural treatments may be very effective, but not all are safe. Please remember that with most herbal remedies, the effects and benefits are not immediately noticed. We generally expect to see the effects of taking a drug in a few hours or a day at most. However, with plant-based compounds, it may take weeks to produce a noticeable effect. The improvement may be so gradual that it may be difficult to notice the changes – until you remember how you were a few months ago. If you use these guidelines when looking for an herbal treatment, you will be able to select the best product for you. Below is one herbal treatment recommended for diabetes patients: Six Flavor Tea. Six Flavor Ttea is a traditional Chinese formula. It is also called “Liu Wei Di Huang Hwan.” This tea has been used in Asia for thousands of years and is recognized by many Asian governments and organizations as an effective diabetic treatment. Six Flavor tea is recorded in many Asian pharmacopeias. Looking for scientific evidence supporting it, however, may prove to be a bit of a goose chase. The irony is that because the formula has been used effectively and recommended by health practitioners for centuries, there has been no need provide scientific proof of its efficacy. Also, because of the impossibility of patenting Six Flavor tea, no one is willing to invest in the research researching this herb combination. In a sense, Six Flavor tea is so well known, so highly recommended, so effective, that its history speaks for itself. This is the case for many herbal products. The six herbs in Six Flavor tea are very common, making them very economical to purchase. You can obtain the names of these herbs on the internet at websites such as www.thetruthaboutdiabetes.info or by visiting a Chinese herb store. You can make Six Flavor tea easily at home. What Other All-Natural Herbal Treatments Are There? There are many other herbal formulations. You can learn about them on the Internet or in the books written about them. Not many years ago, it was very difficult to find information on herbal products and alternatives, but the tide has turned. There are hundreds of herbal treatments that for diabetics. The best one? One word: Eleotin®. Also known as P700, it is remarkably different from not only pharmaceutical drugs, but also from other herbal treatments. While pharmaceutical drugs and insulin injections are for temporary control, Eleotin® addresses the fundamental problem of diabetes. Eleotin® brings about permanent change rather than temporary control. All the ingredients of Eleotin® are classified as food products in Asian countries. Eleotin® is thus a food product, not a drug. We now know that pharmaceutical drugs have very definite side effects. But Eleotin® is completely safe—there are no side effects. Lastly, Eleotin® develops no resistance. So as time passes, users can decrease their dosages rather than increase them. Eleotin® is a fundamental solution to diabetes because it brings about molecular level changes. It is not simply symptomatic relief. *By independent and unpaid third parties. 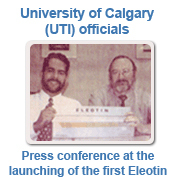 For official claims regarding Eleotin® please refer to www.eleotin.ca. All over the world, Eleotin® has been making headline news. The Chinese Diabetic Association calls it the “ideal cure”. The Korean Diabetic Association called it a “breakthrough cure.” With hardly any advertisement, 300,000 users worldwide have used Eleotin®. Until fairly recently, general skepticism about herbal treatments prevailed in North America. Many believed that anything herbal was not really scientific – but not anymore. Herbal treatments are now an established science. Even though most physicians receive little training or exposure to herbal remedies, thousands of medical doctors has been very open-minded to herbal treatments like Eleotin®. As for pharmaceutical companies, there have been offers of distributorship from the largest pharmaceutical company in China, the largest pharmaceutical company in Korea, and the second largest pharmaceutical company in Taiwan. You have also read about how one of the largest pharmaceutical companies in Europe once offered a buyout. They put a quite sizable amount of money on the table, but it was refused by Dr. Kim. His hesitation was based on his concern that they were trying to buy out this technology and shelve it because it was in direct competition with their own pharmaceutical drugs. This method of business is called predatory acquisition.